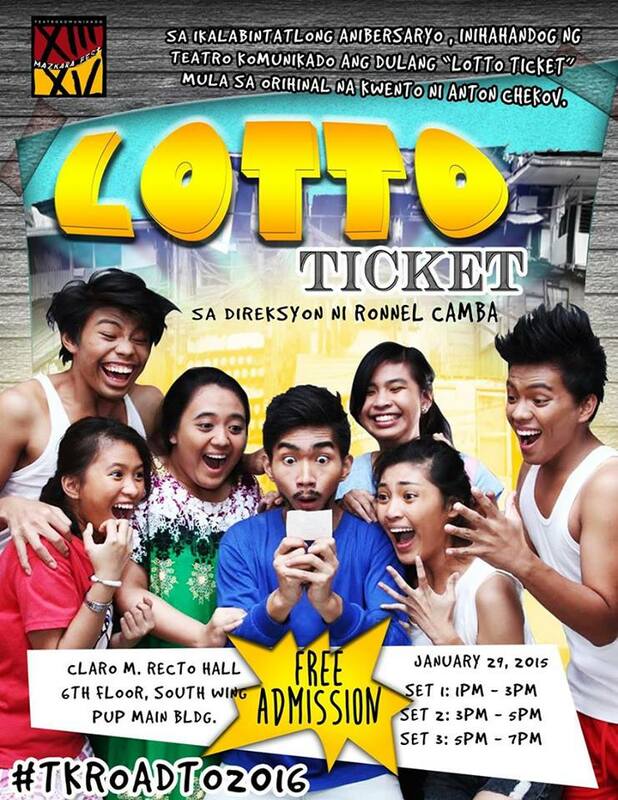 Teatro Komunikado is the premiere theater and production organization of the PUP College of Communication. It’s been their annual tradition to present three plays in one night, to celebrate their anniversary; they call it, Mazkara Festival. Now, on their 13th year, in line with their preparation for their 15th anniversary, they’re presenting MAZKARA FESTIVAL: Ang ikalabingtatlo sa ikalabinglima. 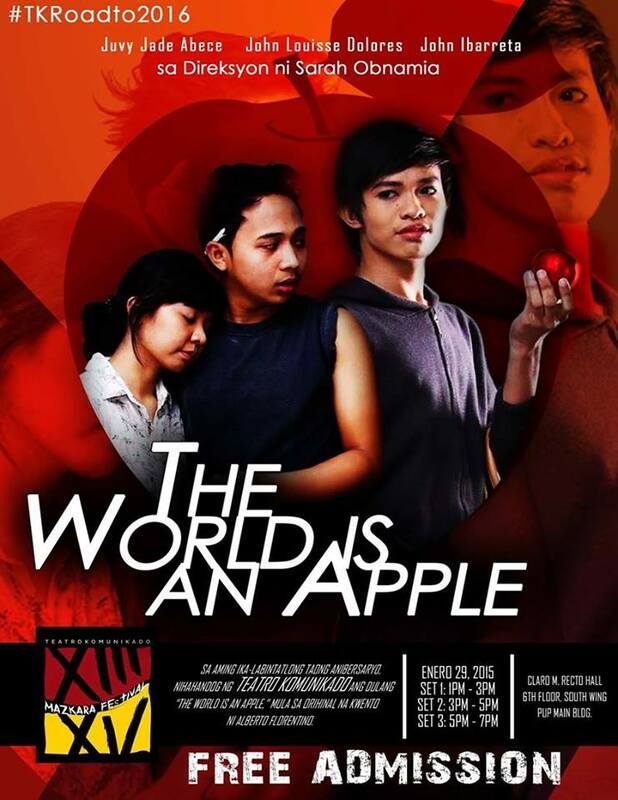 Featuring the plays, Ang Kalupi, The World is an Apple and Lotto Ticket. Throughout the year, TK has shown not only our college, but the entire university that they really make things that are worth talking about. From events they’ve manned to performances that blew our mind, (I mean who can forget their number in our college orientation? Uh-mazing.) to the horror maze, (a literally) blind date booth and “Gabi ng Monologo” The creative juices behind those experiences, well, how could I put it? They did it again! The old tale by Benjamin Pascual brought to life. 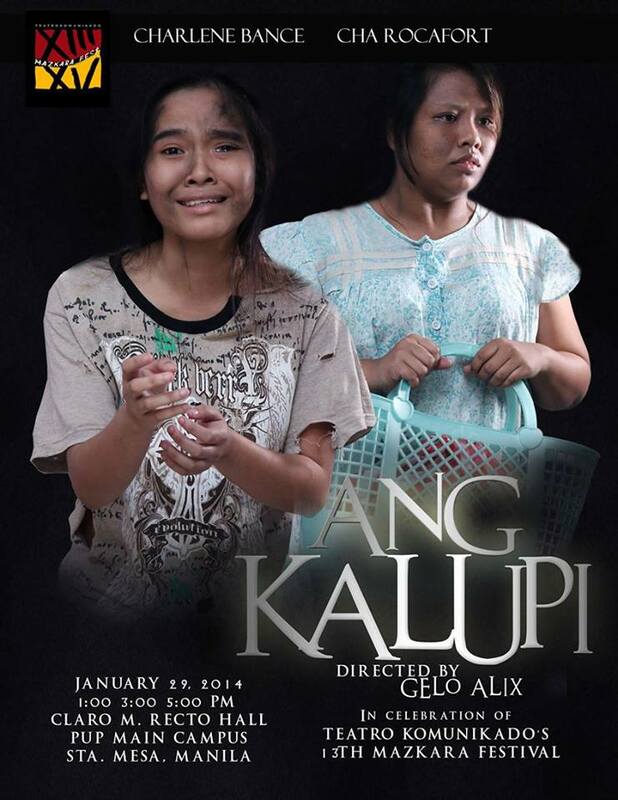 Amazing ensemble and the one who played “Aling Choleng” seems to have been born for the part. Everything here was flawless from the music (which was perfectly timed) to the props, lights, costume. Everything fell perfectly into place. Kudos! A heavy drama by Alberto Florentino. Perfect casting!! All the feels was put into this play and you can really see that the cast were trained really good to be able to play the characters. I can’t say anything else to this because it’s so amazing. Well, I can say one thing tho, I may or may not have shed a tear just before the lights went out. It’s that good. This comedy by Anton Chekov made me (and the everyone in the theater) laugh out loud! For reals! IRL LOL-ing!! (Hahaha.) The set of actors (because there were three shows and some roles got understudies) I got to watch deserves a standing ovation for their spectacular performance. I love, love, looooooooove the show and they all deserve the praise and fans they’re are getting and so much more. The show was magnificent and colorful. I know that most of the cast are freshmen and they’re all promising. The organization is absolutely going to higher grounds.